It makes up all that is. The sun is dust, only dust. Thick red dust that blows up, stings like thousands of yellow jackets, clogs the already parched throat, and grates the skin from everything. The trees leaves are buried in it, lost forever. It is the dust bowl, and even my horse is made out of dust. A simple outline that I have to remake after every wind that blows the lines away. the lines I made with my own two hands. Rough hands, and not only because of the dust. I have sore rubbings on my palms from the twisted reins of a bridle, reins that smell of desert spices. My family asks what the marks are from, and I have nothing to say. I try to tell them about my horse. "You mean that outline in the dust?" Then they laugh and shake their heads, because they never see what I see. Nobody sees what I see. Everyday my soul aches for the full moon to arrive, to fill the air with coolness, a coolness so rare, so precious. When it does come I steal out of our house made of thin, dust worn, boards and go out to the oasis. The oasis appears when my horse does. First, there is only a hill of sand with my fingered outline on the very top. Then the dust in my horse's shoulder area begins to swirl and fly in poofs into the air. A horse begins to form out of the dust, my outline. It rising up with flying particles of sand, and then I see color, it is a dapple gray, an Arabian. Long eyelashes flick up to reveal eyes as blue as the stars. There is the oasis then. I see it all, I feel it, smell it. It is real: the trees, bending over to dip their frond-like leaves into shivering pools of water. There are tents, and people in the tents. Arabs. 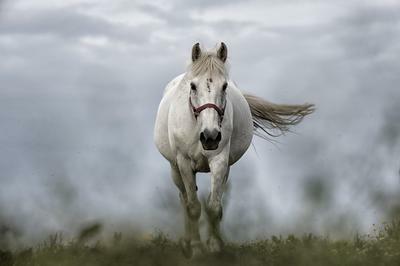 I'm not in the bottom of the bowl of dust anymore, because my horse is showing me a new place: the old deserts, and the people and horses of them. People come out of their tents when I mount. Laughing shepherds chase a few fat, woolly sheep towards a small pond. Children shimmy up the trees to reach the small fruits. My horse's eyes glow. Truly, this horse isn't mine. Every full moon when I do this, the horse's real owner gets to see him. The horse's name is Rashan, and his owner is the great Ali Katj. And Ali Katj, like me, only sees Rashan at the full moon, when I ride him into the midst of the beautiful camp. My heart wells up with something like jealousy as Ali Katj comes out of his tent. He is proud and respected, but I can see emotion dripping from his eyes. He can barely contain himself as he walks reservedly up to Rashan, who is very excited. Rashan tries to trot towards Ali Katj, but I pull him up. His beautiful neck pushes that gorgeous head towards his true love and master. They meet and I can see glimmering tears of the joy of reunion coming from Rashan's lovely eyes. And I am jealous, because Rashan will obey me, but he does not love me. Ali Katj is everything, and I am just a dust-torn girl from another time. Thanks for the comments y'all! I love writing a lot and I've been doing it forever. So I'm really sorry because I had no plans to continue writing it, and I couldn't even if I tried. My other story "Broken" is on here, but it's not as good. Feel free to read it though and tell me what you think. We are eagerly and not so patiently anticipating the rest of your story. You wrote this?!! It is so full of imagination, and...I don't know what else but it gives me such a cool weird feeling I love it. Please continue more of the story, don't get bored and stop writing it. I do that all the time -- I start writing a story and I don't think it's good anymore or I get bored with it... but this is a seriously cool story and so please continue writing it asap.